A significant amount of my work is spent supporting coaches and other entrepreneurs in launching and growing their businesses. One of the biggest challenges I’ve found is the constant struggle for my clients to quantify the value they are delivering and translate that into an appropriate price point of their product or service. 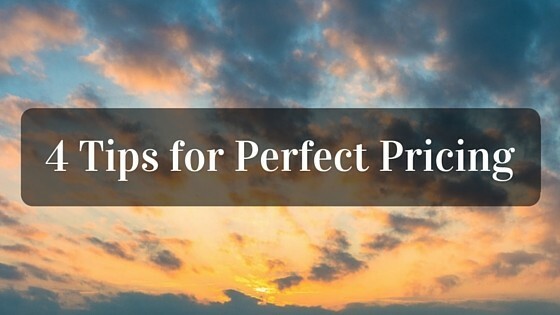 Below I share 4 key points you must consider when setting your prices. #1 You Get What You Pay For – Your price point is a reflection of the value you deliver. Even if your program can help people earn $1M, the right audience won’t give it a second look if the price point is too low. Think of it this way; there are just some products that you would NEVER buy at a dollar store. For an extreme example, I’ve heard dollar stores are now carrying “family planning” products. Would you trust a dollar store product to play a significant role in your family planning? I hope not. #2 The Level Of Investment Is Directly Proportional To The Level Of Commitment To Achieving The Results – When it comes to a program that requires implementation or “homework”, you will almost always see greater results at a higher price point. Why? When someone has more “skin in the game”, or “more to lose” they will work harder to avoid that loss. I once attended a training course on how to run a coaching business. This was right after I had left my place in the corporate world, and the investment for the course was $2,000. For me, this was my LAST $2,000! But I knew this business was where I needed to be. Once I got there I found that many of the other participants had only paid $200! I was unimpressed, to say the least, but the training forced me to get extremely uncomfortable. At one point I considered leaving – but I couldn’t just walk away from my $2,000 investment. I was all-in. Looking back, if I had only invested $200 there is a good chance I would have left. It turns out that the part that made me the most uncomfortable – public speaking – was a key factor in growing my network, my influence, and my business. I’m glad I stayed. Now, almost exactly 3 years later, I look back at who attended the training. It’s safe to say that my business grew significantly faster than most other attendees. I think the price I paid to attend played a big part in that. #3 Time Is The Most Precious Asset We Have. You Can Always Make More Money, But You Can Never Make More Time. – In the coaching, consulting and training space we often talk about how many hours we are investing directly with our clients. This is vitally important to track. In traditional businesses, the “labor costs” or costs for employees’ time are including in their “Cost of Goods Sold” calculation. Determine how much of your time is invested in supporting your clients. Thankfully technology has made it easy for us to leverage our time, allowing us to serve multiple people at once, or create digital products that can continue to add value to the marketplace after it has been created. Be cognizant of the time you invest in a product, program or service and charge handsomely for it. The value you deliver to a client should not be viewed as dollars per hour, but impact per hour. Working 1-on-1 with a client adds significant value to what they are looking to achieve. Every hour you dedicate to other tasks has an opportunity cost. What is the highest and best use of your time? If you can be delivering value that someone will easily invest hundreds of dollars for, then don’t spend your time doing $20.hour tasks – consider delegating or outsourcing those tasks. This will allow you to create the maximum impact in your marketplace and your life. Ensure you value your time at a very high level. #4 Selling On Price Is A Race To The Bottom – Attempting to acquire new clients by charging less than your competition for a similar product or service is a recipe for disaster. You must earn a profit in order to support the infrastructure necessary to continue delivering great value to the marketplace. Sell based on that value. People will pay more for a better experience or greater results. If you offer a remarkable experience or deliver a powerful result, you can ask for a greater investment from your clients for it. Positioning yourself to work with few clients at a higher investment allows you to serve at a greater level, usually leads to greater results for your clients, and is a fantastic way to use your time more effectively. Next time you review our prices, read over these 4 points. Higher prices help to position you as an authority in your space (as long as you can deliver the result or experience to go along with it) and often lead to greater results from your clients. Use technology and outsourcing to better leverage your time and increase your reach and be sure to sell your services based on the value you deliver, not on price. The 4 points will play a big role in your success. Want to learn how to close sales at those higher price points? Download the 5 C’s of Successful Sales Conversations to guide you through converting your prospects into 5 & 6-figure sales.